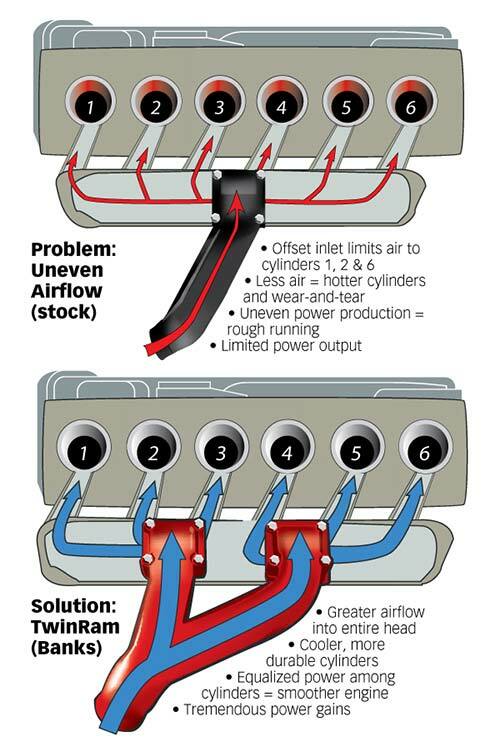 TwinRam intake manifold doubles the inlet area, optimizes air distribution into the cylinder head, and flows the boosted air proportionately into all six cylinders. The equalized air-streams do away with lopsided internal temperatures, balance cylinder air volume and produce smoother output. Enhances power, mileage and durability. TwinRam intake manifold doubles the inlet area, optimizes air distribution into the cylinder head, and flows the boosted air proportionately into all six cylinders. The equalized air-streams do away with lopsided internal temperatures, balance cylinder air volume and produce smoother output. By driving a greater charge of air into each chamber, TwinRam amps up the power rating, improves mileage and durability, and reduces emissions.